Here’s a question: What music comes to mind when I say “telekinesis”? It’s a bit of an odd question but say, for instance, that a composer had to make music all based off the idea of one vague idea: individuals with psychic powers. What would he or she do? What musical instrument or theme would fit that fantastic element? The concept may seem a little abstract, but sometimes, that’s all a composer initially gets to base a soundtrack on. Composers aren’t usually given a complete version of the material to work with (although composition is traditionally done much later in the creation process so they might have some visuals), so a lot of composition may come down to just a feeling or an idea that they get. Yoko Kanno, for instance, is famous for taking something so vague as “being human” and making an entire body of work based off of it. On the western side, when Christopher Nolan was creating Interstellar, he initially gave the film’s composer, Hans Zimmer, the concept of “a father and son” (later changed to a daughter), without telling Zimmer anything else about the film. This was specifically to get to the heart of what Nolan felt the film should be about. Vagueness, in this way, allowed for a lot of creative freedom, but at the same time, as many artists can tell you, too much freedom can be oppressive, leaving them to not even know where to begin. However, because the initial idea may be so vague, the same concept done by different composers can lead to amazingly diverse music, which brings me back to the music of psychic powers. Not anime related but absolutely worth a read for any fan of games or music. Some of the best and more interesting soundtracks on here. I’ll be finishing up some posts soon! Trigun: Call Now and We’ll Double It. Double the Bullets, Double the Action, and Double the Dollars. So I’ve finally moved in about one thousand five hundred miles away from where I used to live and have a full-time job with slightly odd hours so it’s been a bit harder to make updates. On top of that, I had a bit of writer’s block while writing this and ended up solving it by starting up a second blog for my own passion project of creative writing at StoryTimeWithMythos. However, I will say that now that I’m moved in and finally have some free time, I’m dedicated to updating for you guys with more interesting articles and the like. The next few articles will be more about specific subjects rather than saluting an anime from my youth as I enjoy those a lot better and feel they’re much stronger discussions. Even today, one hundred years after the remnants of the pioneers finally explored the frontier and civilization started booming, we’re in love with the idea of The West. The Western genre has covered a historical hundred-year gap from the end of the frontier to today with films and shows that explore the ideas from that time in America. It was that wonderful part of history where those who made a mad dash for land carried a gun, lived by their own hands, and occupied lawless towns near inhospitable and harsh wastelands. It’s not just America that’s been fascinated by this idea either. Many countries around the world have loved to make their own ideas from this setting. In fact, the reason the famous subgenre of Spaghetti Westerns is called as such is because they were Italian films. Nowadays, you don’t see many westerns being made. Cinema fell in love with the later genres of the 20th century that took hold after the boom of space odysseys in the late 60s through the 70s that changed science fiction from pop serials to the big hit movies of the later decades. However, that doesn’t mean the genre has died out. Recent films like The Good The Bad, and the Weird put their own unique twist on the genre and Clint Eastwood even stepped back into his old shoes to do an oscar-winning and absolutely beautiful revisionist version of the Western in Unforgiven. One of my favorite ideas that has evolved from the Western genre, though, is to take the plot, style, and characters of the Western and apply them to a new frontier to explore. 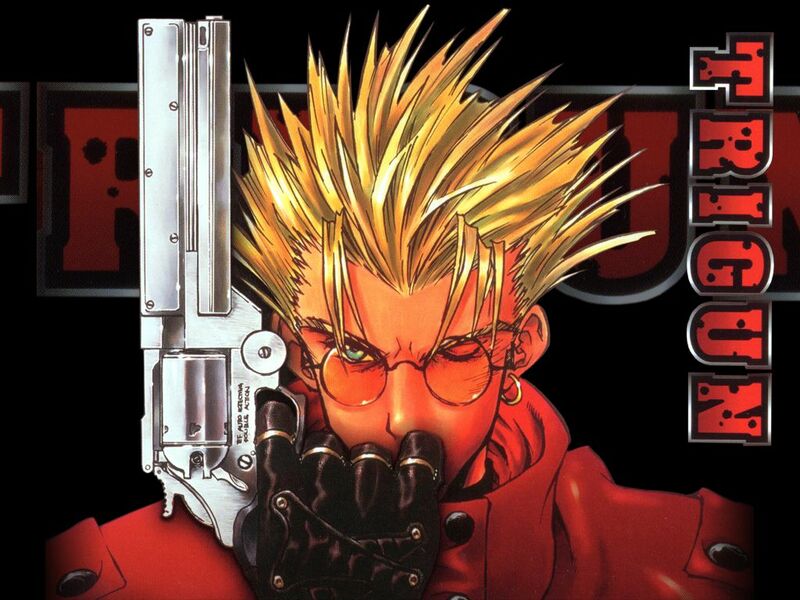 Particularly, in the case of Trigun, I’m referring to the Space Western.